By writing this book, Peter von Brackel filled a void in the available paperweight literature that most collectors didn't realize existed. 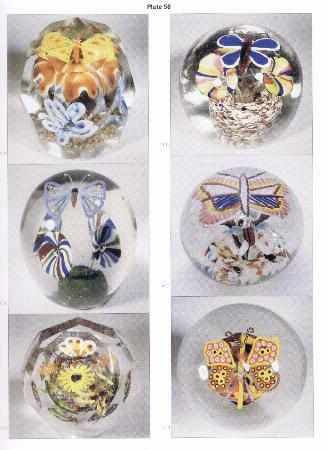 The book includes a survey of paperweights produced from 1842 to the present and then focuses more closely on the post-classic folk art glass paperweights produced in Europe between 1870 and 1940. It contains much previously undocumented material about the output of a number of glass houses and glass producing regions. Examples are included from Bohemia / Czechoslovakia , Silesia, Thuringia / Saxony, the Bavarian Forest, the "Solling" mountains, other German regions, Austria, Hungary / Romania, Northern Europe, Belgium, France, and Russia. There are sections full of drawings illustrating the profiles of these paperweights and the patterns used for beveling the weights. There is also a section illustrating the methods used to make these weights. 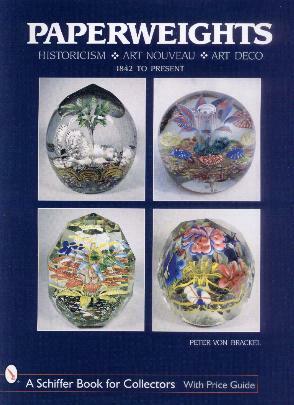 It is full of wonderful pictures and is a must have book for any serious collector of glass paperweights. 320 pages with 639 color pictures of 720 paperweights. 131 drawn illustrations. Hard bound. 8 1/2" by 11 1/4". 1999.